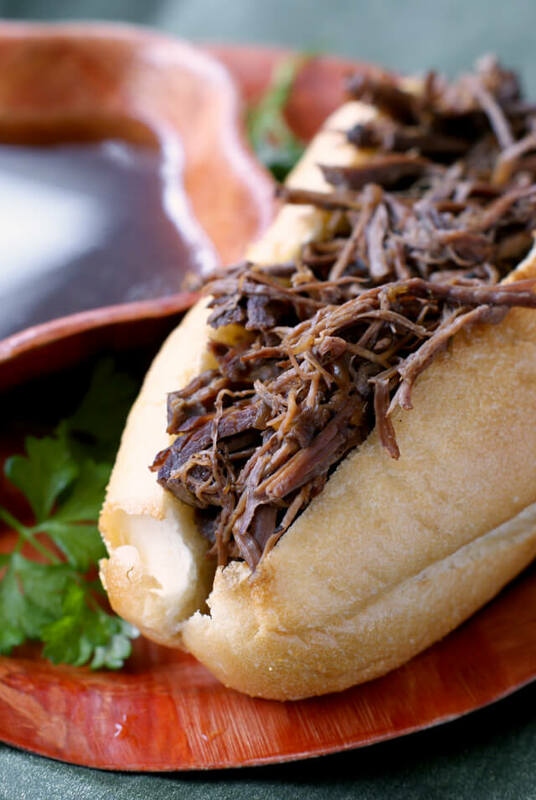 Crock Pot French Dips are super easy to make shredded beef sandwiches served alongside a rich au jus for dipping. 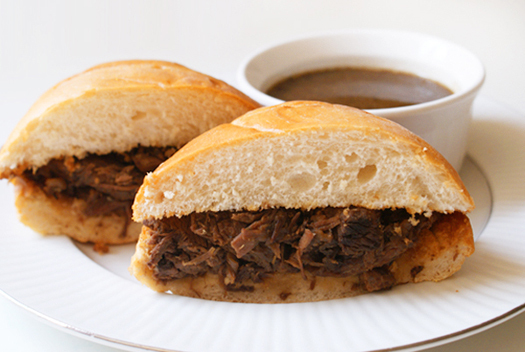 Time to bring out the slow cooker again, because I've got a deliciously easy recipe for you. 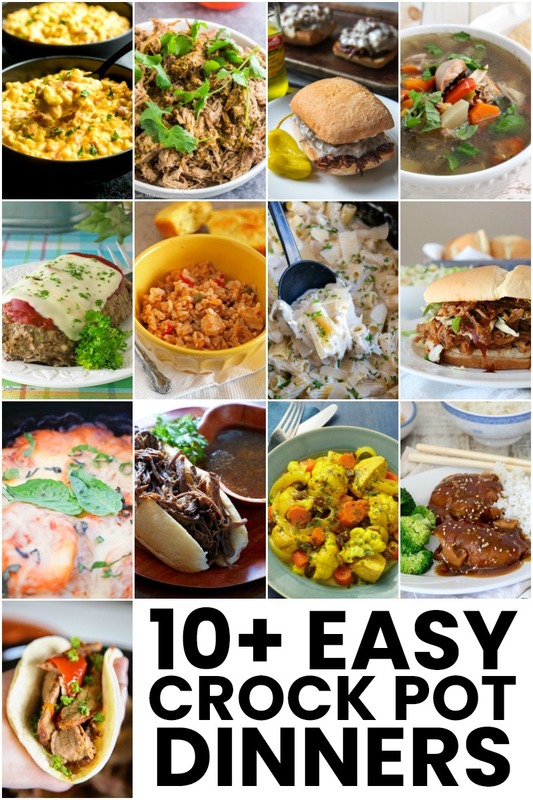 What crock pot recipe isn't easy and who doesn't like delicious?! My french dips are not exactly the traditional style, seeing as I don't have a slicer to cut the meat into thin slices. Instead, I slow cook a roast of beef until it's nice and tender, shred it and then return it to the crock pot for a bit to soak up all of the flavorful juices. There are several different cuts of beef that could work for this recipe. 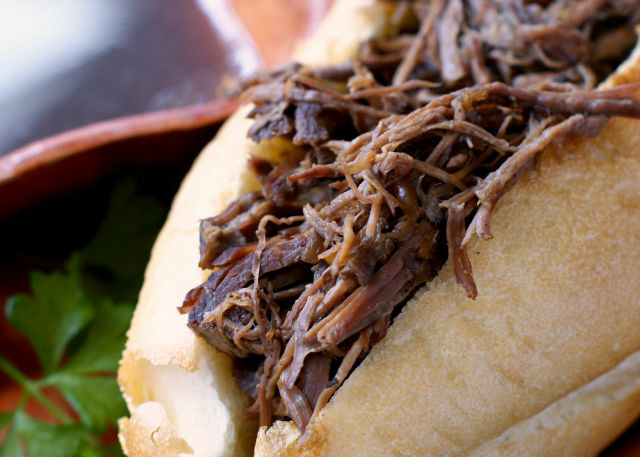 A chuck roast would work well...a little bit on the fatty side, but the fat adds flavor! If I order my usual package from the meat market, I'll have a sirloin roast on hand, so that is what I used this time around. I love the idea of making a meal that can be made over into something else with the leftovers and that's exactly what you can do with this recipe. Your leftover beef can be used for shredded beef tacos, quesadillas, or beef stew. I've even had the beef over a crisp garden salad. Yum! Have you tried this easy dinner recipe? I'd love to know what you think in the comments below! Enjoy! 1. Place roast in the crock pot. Add consomme, french onion soup, garlic powder, thyme, rosemary and worcestershire sauce. Cook on low for 7 hours. 2. Shred the beef using two forks. You can do this right in the crock pot, but if you're having difficulty you can remove the beef from the crock pot and shred it on a cutting board and then return it to the juices. 3. Cook for one more hour to allow the shredded beef to soak up some of the juice. 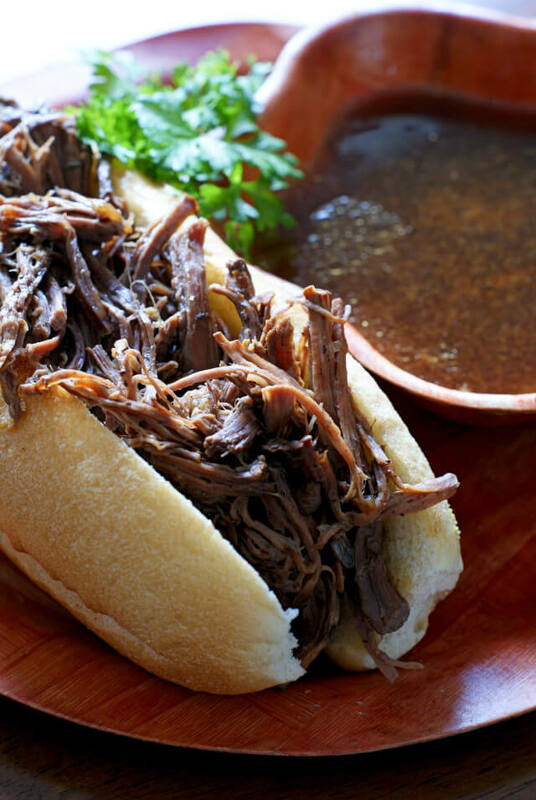 Serve beef on a roll with the au jus on the side for dipping. Post images updated on September 26, 2015. Original image below. I love this! I am always standing around the crockpot picking out the bits and pieces from the broth. Thank you for this simple to follow recipe.